Prepd’s research tools level the playing field. 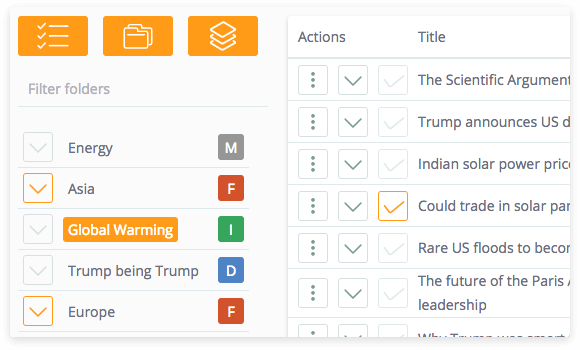 The News Feed immediately auto-files 150,000+ articles from over 50+ different news sources. 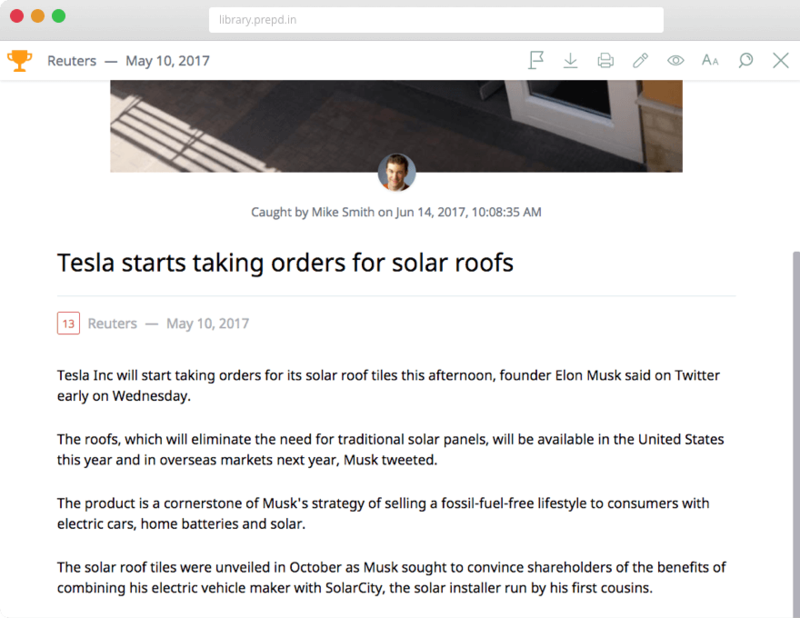 Beyond auto-filing, Prepd’s Fast Catch Chrome extension allows you to save web articles with a single click. You can also drag and drop PDF files. Save up to 250,000 articles in Prepd. The more you practice, the more you’ll improve. 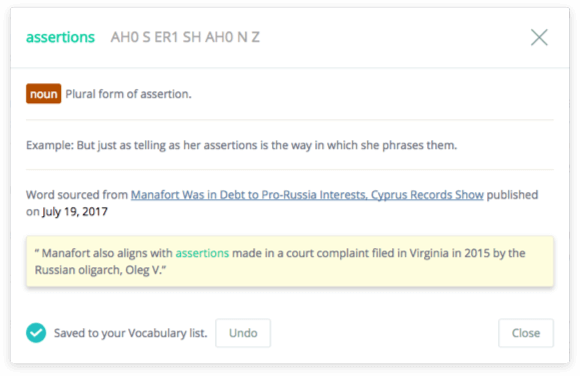 Prepd is packed with useful features that help debaters prepare. 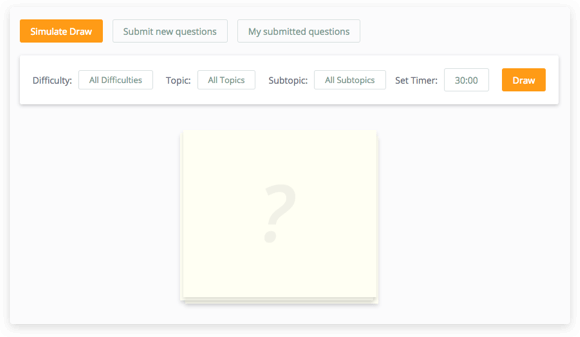 In Extemp, hundreds of practice questions are added by students and curated by Prepd’s staff. 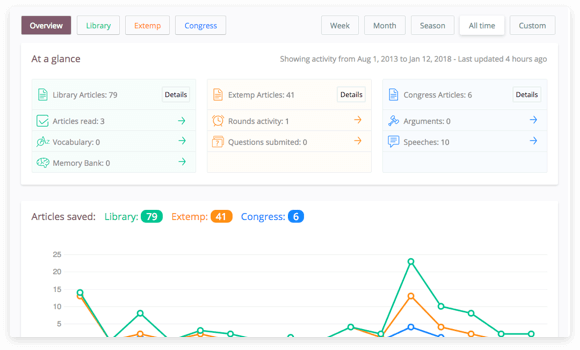 In Congress, you can easily create evidence blocks from your research and organize speech outlines. Prepd makes you more productive. Period. Every little detail is designed to maximize your efficiency in round. Navigating through folders is a breeze. Searching for articles is blazingly fast. 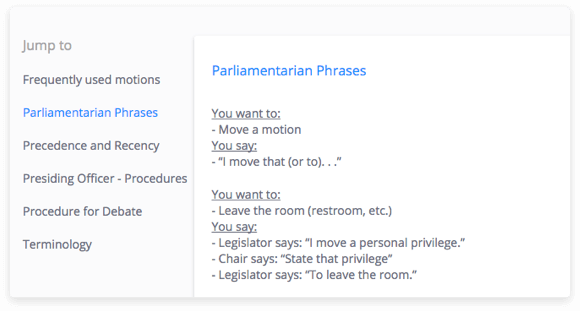 In Congress, tools like the parliamentary procedure guide and the precedence tracker will give you an edge. Have an iPad? 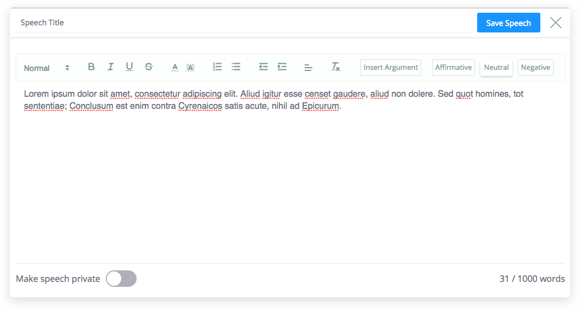 Download Prepd – Extemp. 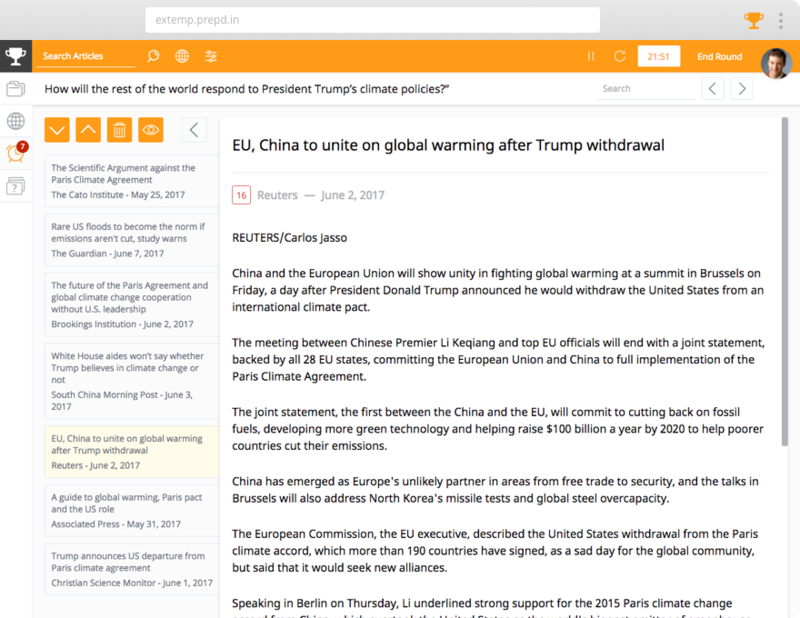 Prepd is much more than a place to store files – it’s an education technology uniquely built for debate nerds. 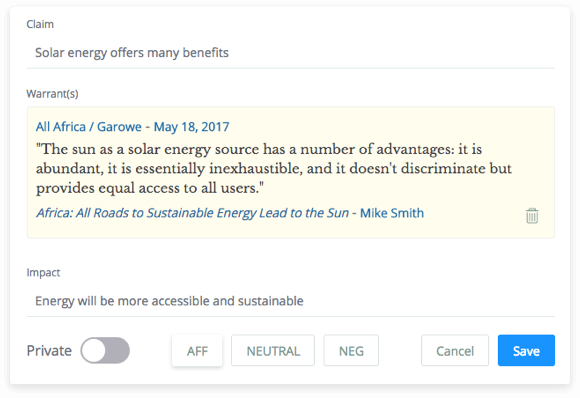 By making it easy to interact with article content, Prepd helps debaters learn while they read. Highlight content. Look up and save definitions of unfamiliar words. Create flashcards. Track reading activity. 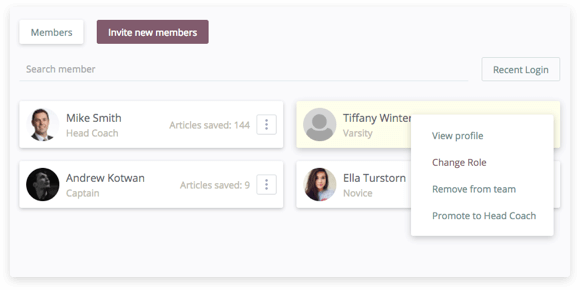 Prepd works great for teams that want to collaboratively share files as well as individuals who compete independently. Big, small, or on your own – Prepd helps every type of debate program. Every member has access to rich analytic tools that track filing, reading, and competitive activity. Over 27,000 students and 800 schools or clubs use Prepd to research, practice, and compete. Extemp is the ultimate software for extemporaneous speaking. 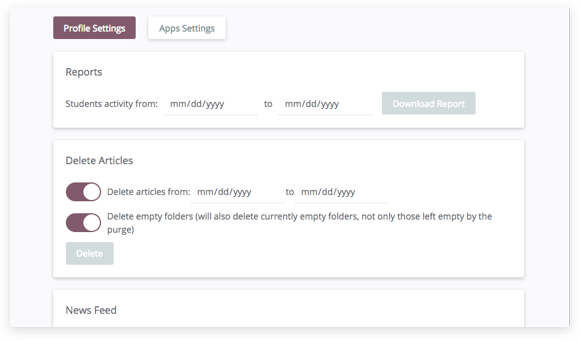 Organize your articles into folders and sub-folders, or run advanced search queries. 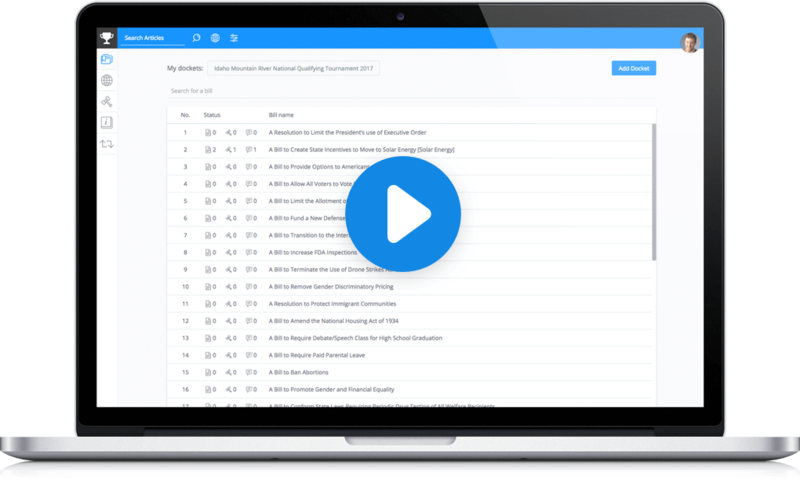 Access hundreds of practice questions. When competing, create a “Round” to prepare productively. With Congress, you’ll be the most prepared debater in your chamber. 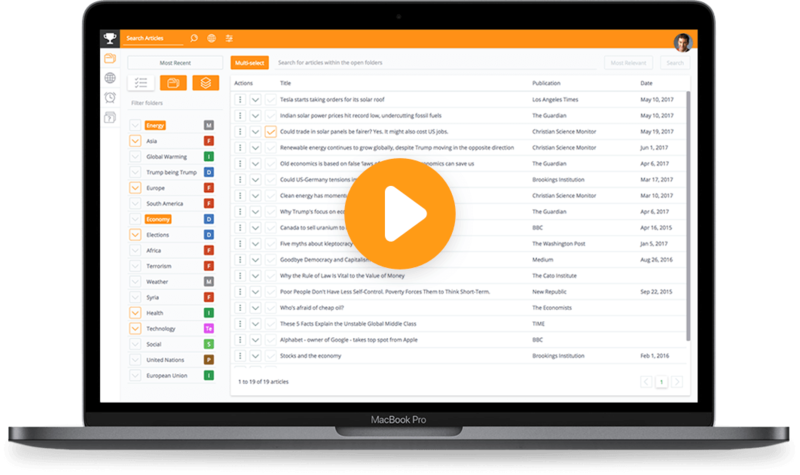 Efficiently manage your bills, research, and speeches. Save “arguments” (or evidence cards) directly from your reading. When competing, easily track precedence and recency. General purpose research and education technology. The Library is a hub that stores all of your research. The Library also helps you learn more while you read. Save interesting article content to your Memory Bank. Save word definitions to your Vocabulary List. 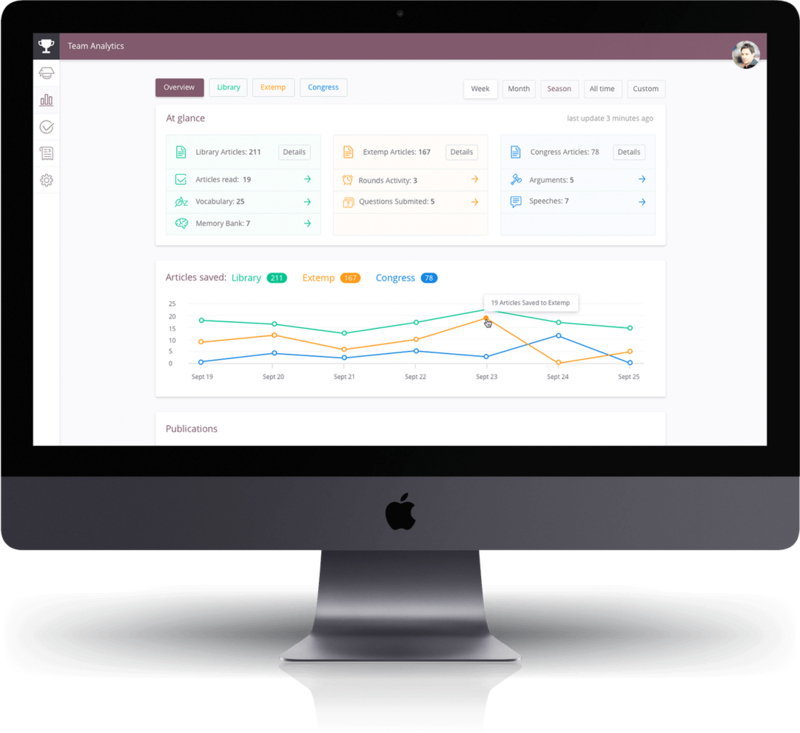 Manage and monitor individual or team activity with the Classroom. Review filing and reading activity. Change user roles. Download analytics reports. Exchange evidence before and after your debate round. EvidenceX is a free app that’s available to Prepd users and non-users alike. 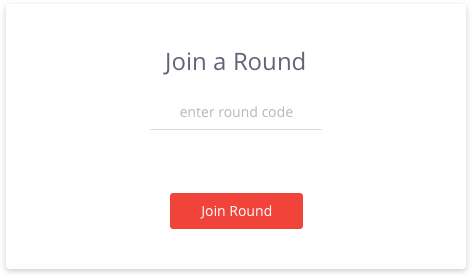 Go online to create a Round. 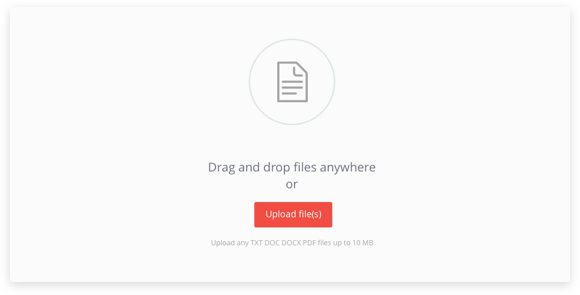 Drag and drop files to exchange evidence with your competitors and judges. 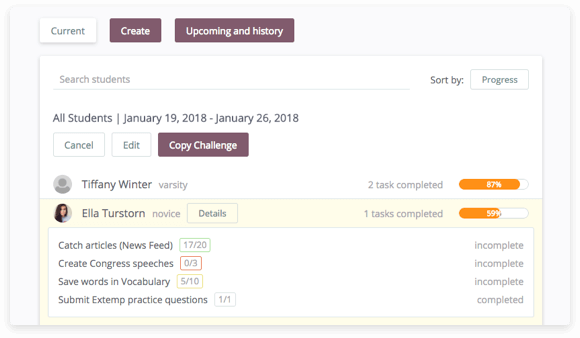 Prepd’s apps are built uniquely for debaters and coaches. Which debate events does Prepd’s software support? Prepd is a collection of four different applications. Prepd has built dedicated apps for Extemporaneous Speaking (Extemp) and Congressional Debate (Congress). We have not built applications that support Lincoln Douglas, Public Forum, Policy or other styles of debate. That said, many debaters have found that Prepd’s Library application works well for general purpose research. 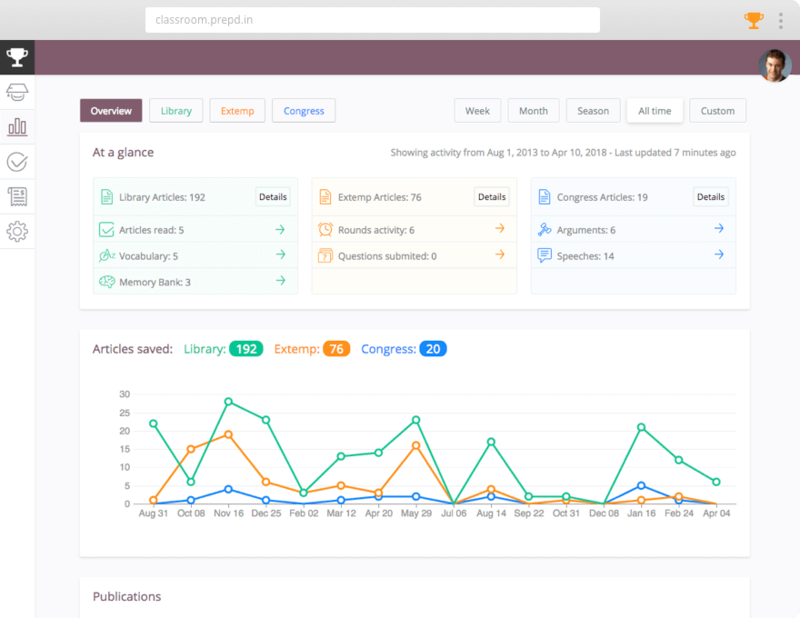 Prepd’s fourth application, the Classroom, supports team and account management. What is the total number of articles that I can save in Prepd? Does Prepd auto-file articles? 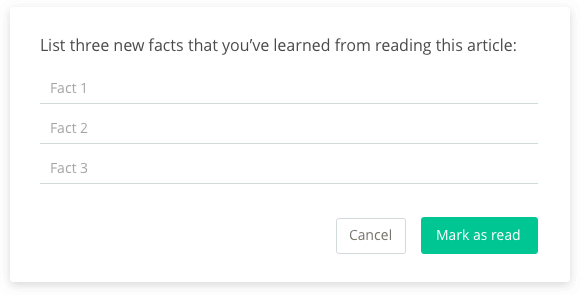 If so, how many articles and sources are auto-filed? Yes, Prepd’s News Feed is a feature that automatically files articles. You can access the News Feed from the Library, Extemp, and Congress. The News Feed updates every hour with new articles from over 50 different sources. It stores about 100,000 auto-filed articles that have been published within the last three months. You can permanently save News Feed articles to any Prepd app. For a full list of Prepd’s News Feed sources, please read this blog post. Do I have to save my research into folders? 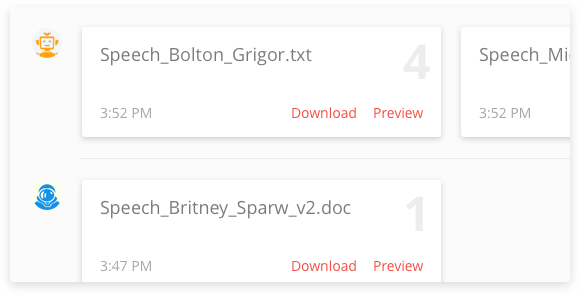 We’ve learned that some debaters want to organize their research into folders and sub-folders, whereas others don’t care for folders as long as they have great search tools. Fortunately, Prepd supports either research style. 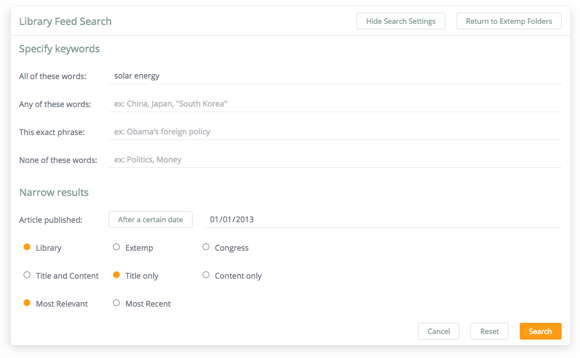 If you want to save your articles into folders and sub-folders, you’ll be saving files to the Extemp app. If you don’t plan to use folders, simply save articles to the Library with a single click and then use Smart Search when you’re looking for articles. If you’re not using the folders, you’ll want to compete with the Library app. If you are using folders, compete with Extemp. Prepd runs exclusively on the Google Chrome browser. 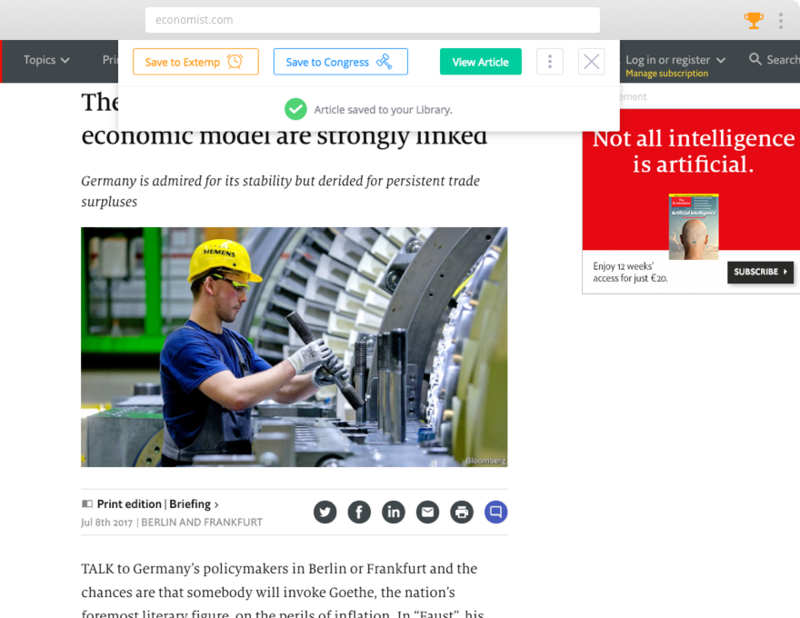 Because Fast Catch – a one click solution for saving web articles – and Prepd Offline are both built as Chrome apps, we require every Prepd user to access the software through Google Chrome. Any laptop or desktop computer that can run the Chrome browser will support Prepd. Our debate technology runs on virtually all Windows computers, MacBooks, Chromebooks, or Linux devices. Does Prepd work offline, without internet access? Yes, Prepd offers a Chrome extension, Prepd Offline, that allows you to compete without internet access. Install Prepd Offline to your browser by visiting the Chrome web store. Before each tournament, you’ll want to synchronize your files by opening Prepd Offline while you are online. Once you’ve synchronized your files, you can disable the internet, close Prepd Offline, and even turn off your computer. Whenever you reopen Prepd Offline, it will recognize that you are offline and will open the files that were most recently synchronized. Can I use Prepd on my smartphone or tablet? Very, very fast. Prepd’s online, web applications load in seconds. Search results populate in milliseconds. 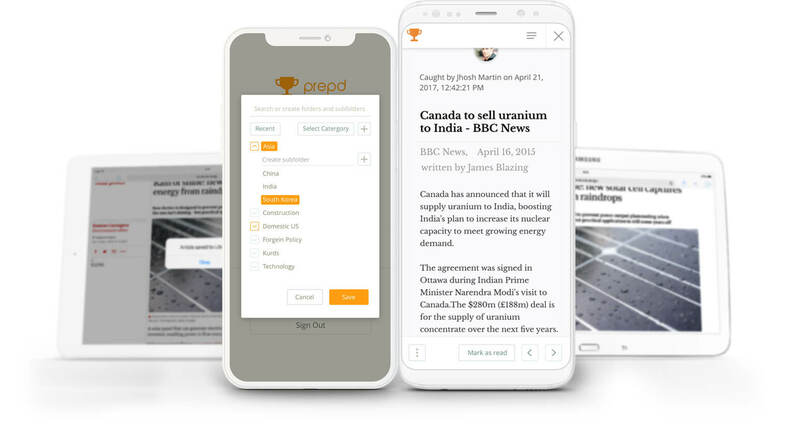 In Prepd Offline, synchronizing 100,000 articles takes two or three minutes, depending on the strength of your internet connection. 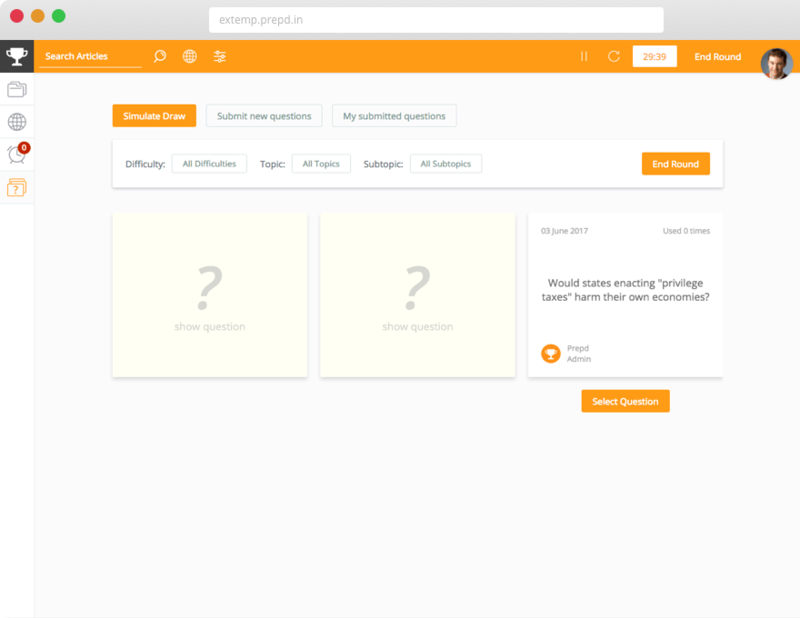 Is Prepd built for individual debaters or for debate teams? Both individual debaters and debate clubs will enjoy using Prepd. For individuals, you may purchase a Premium One membership for as little as $25/year. Those with Premium One accounts have access to all of Prepd’s functionality, but can’t share their research with others. If you are part of a Premium Team, all your research is automatically shared with all your teammates. Prepd membership costs vary according to the events you or your team competes in (Extemp, Congress, or both) as well as the size of your program. Please scroll down this webpage to visit the Pricing Calculator. Once you’ve calculated your price, you may submit some basic contact information and unlock a 15% discount. How long does a paid membership last? Premium Team and Premium One memberships last exactly one calendar year from the date you purchased your membership. For example, if you join Prepd on September 1, 2017, your membership will remain active until September 1, 2018. Once your membership expires, you have the option to renew your membership through the Classroom. Prepd does not automatically renew memberships on your behalf. You must explicitly opt-in for another year. How can I pay for a Prepd membership? You may pay with a credit or debit card. If your annual membership costs more than $100, you may also request to pay with a check and specify whether or not you would like to receive an invoice or submit a purchase order. If paying with a check, you’ll have immediate access to Prepd and a thirty day payment window. Prepd will automatically email you an invoice (if paying with a check/PO) or a receipt (if paying with a card) once you complete your purchase. Who is behind Prepd? Is this a real business? Prepd LLC is a four year old company that was founded in the spring of 2013. The company is operated by its founder, Ian Panchèvre, a former high school and collegiate debater. Ian graduated from Yale and currently lives in Silicon Valley. The entire Prepd Team consists of seven full-time team members. Prepd’s professional product team builds best-in-class software for the competitive speech and debate community. Where can I find support resources? We encourage new Prepd users to watch the tutorial videos for Library, Extemp, Congress, Article View, Fast Catch, and Prepd Offline. If you have specific questions or issues, you may visit the Help Center. Check out Prepd’s blog and Facebook page to stay up to date on all things Prepd. Finally, if you ever want to get in touch, feel free to email hello@prepd.in. Prepd’s membership cost varies for teams and individuals. As a result, Prepd is affordable for every debater or program. Use the calculator below to determine your price. It takes one minute! Prepd’s membership cost varies for teams and individuals. 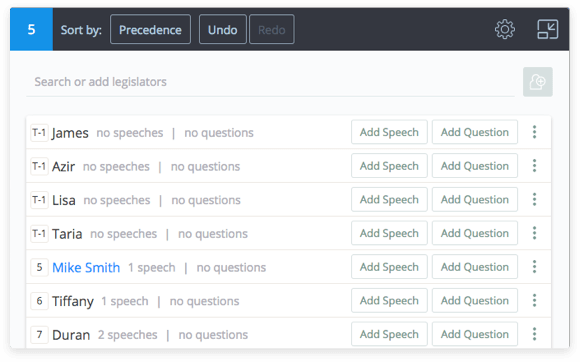 As a result, Prepd is affordable for every debater or program. To use the pricing calculator open this page on a desktop or laptop! Do you want to use the most advanced technology ever created for Extemp and Congress? Use the Google Chrome browser to Join Prepd now. It only takes a minute.